A newly tiled floor in a new room of the house is almost enough to give me jazz hands (a York peppermint patty is enough to give Sherry jazz hands, so clearly we have different thresholds). 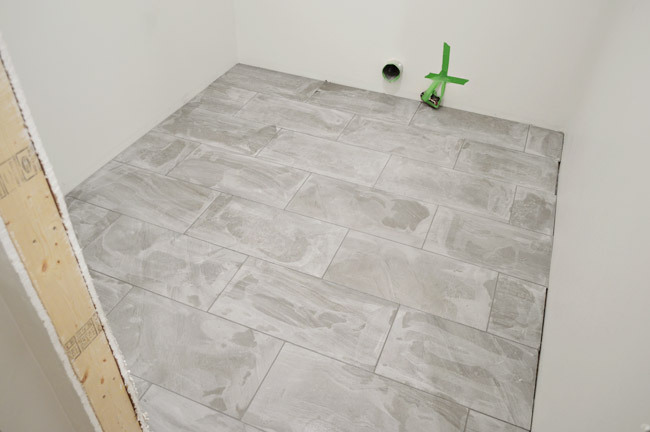 We’re completely enamored with this floor – and there’s a budding romance that involves a saw – so let’s cover the laundry room tile installation, from floor prep to grouting & sealing. 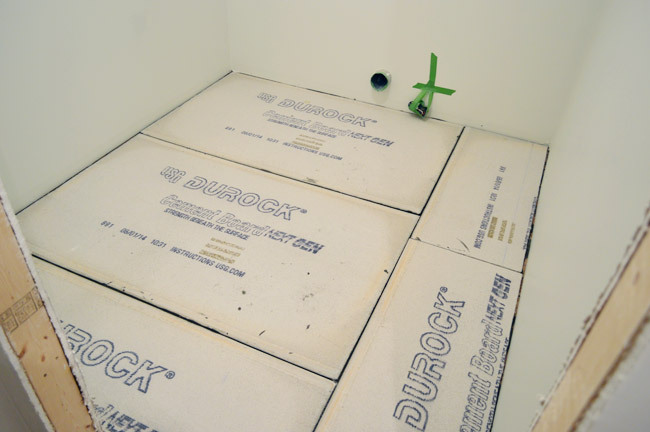 Before any tile could get installed, the subfloor needed to be prepped with some cement board, which is a preferred surface for tile installation. They come in 3ft x 5ft sheets, so I was able to fit two full pieces plus a few strips in the room. I cut them all by just scoring them with my utility knife and then breaking them along that line. Once I had “dry fit” all of my pieces, it was time to actually adhere them with thinset. The layer of thinset between them and the wood subfloor will help keep them from shifting, grinding or flexing against one another. 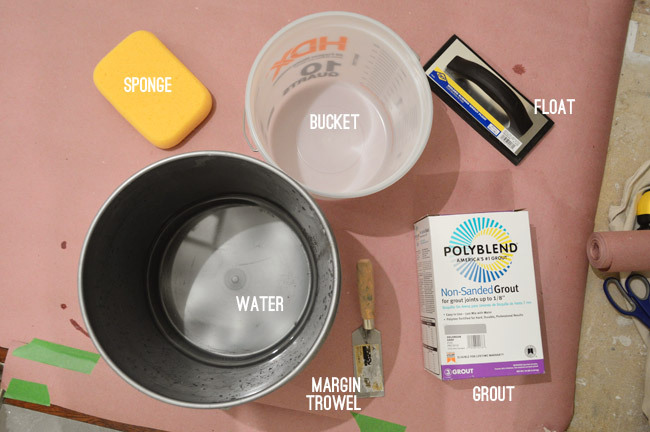 I used the same thinset I would later use for my tile install, mixed with water (just by following the directions on the bag) and my drill’s mixing paddle. I’ll get into more details about the whole mixing-of-the-thinset process in a second. 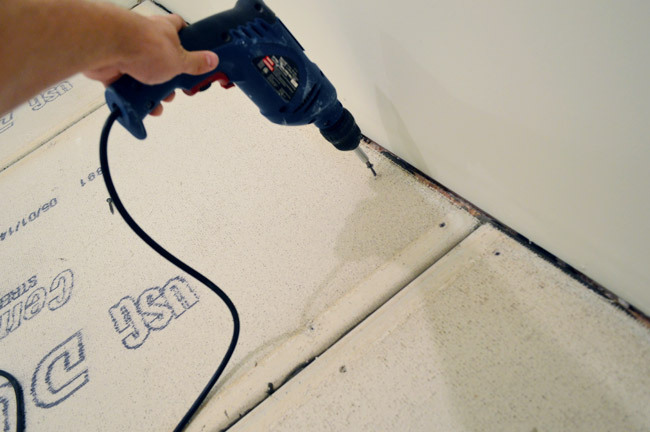 I spread the thinset using a 1/4″ notched trowel – coating the surface with the flat side of the trowel (doing one cement board area at a time) and then scraping grooves into it using the notched side, just like you do when you install tile. 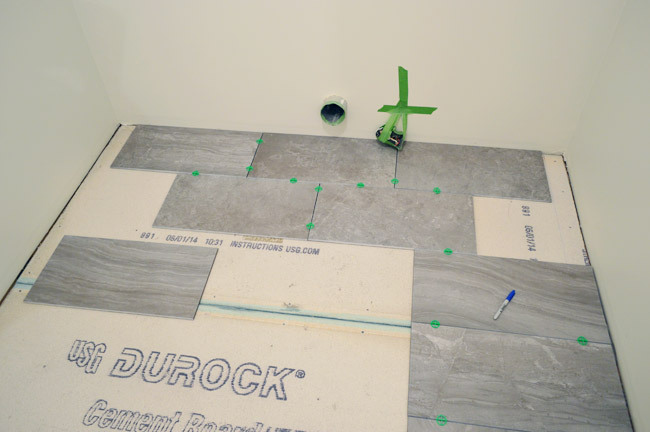 Then I was able to press the cement board pieces in firmly and move right along. 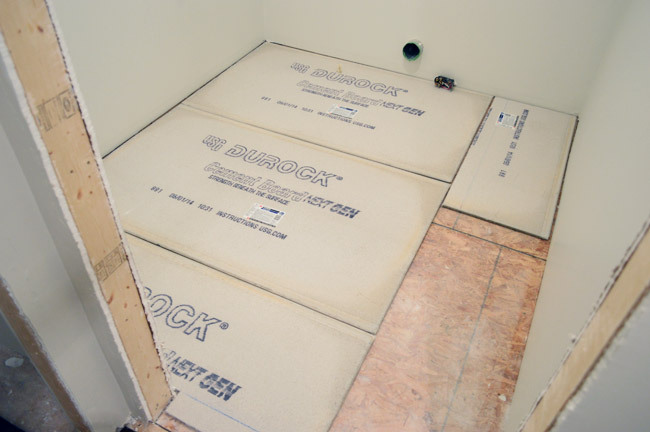 Here are all of the sheets down, with about an 1/8″ gap between them and the wall. To help pull them securely towards the floor during drying (and to further stabilize them for the long term) I screwed down the edges (about every 6-10″) using special cement board screws. And I threw a few in the middle too – about every 12 to 16 inches. 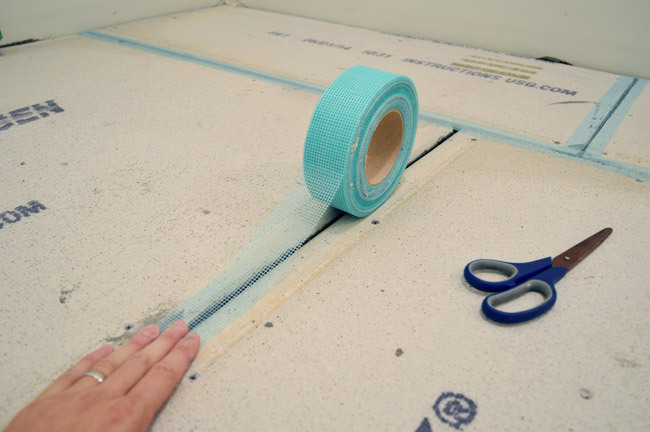 Many tutorials have you tape and mud (with thinset) all of the seams and screw holes next, just like with drywall. 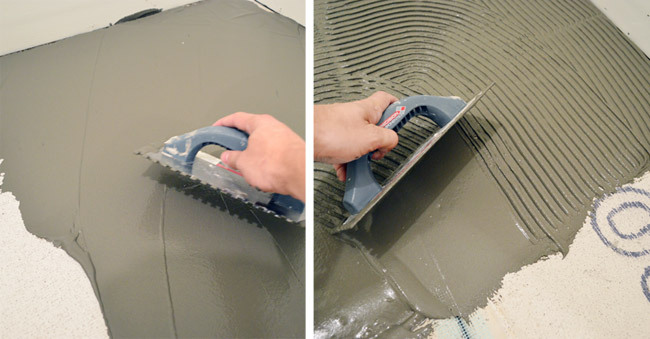 I’ve found it easier to just apply the mesh tape on the seams now and then apply the thinset during the tiling process. For me, it keeps me from accidentally creating any high ridges at the seams or screw hole bumps that the extra layer of thinset might create. After mesh taping all the seams, we could start dry fitting our tiles, just to figure out the best way to situate the brick-pattern we were going for. We started off by centering the pattern, but we weren’t crazy about the thin slivers of tile it would have left on either side of the room. Note: Just look at the back two rows here (the closer tiles are just randomly placed). After a decent amount of experimenting, we opted to shift the pattern slightly towards the left wall, which meant we could use a full tile on the left side, and also left room for a bigger piece of tile on the right end (no more tiny slivers). The washer and dryer will be offset to the left side of the room anyway, so we think it’ll feel nicer this way (especially since those few smaller cuts of tile on the right side will mostly be hidden by a base cabinet in that back corner and the door to the room, which will swing to rest along that side. Note: Once again, just the two back rows of tile are placed in their intended positions here. Cutting the tiles was super easy. Why? Because we finally bought a full-size wet saw. 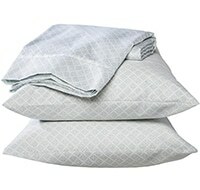 After nearly five years of using our old $99 hand-me-down tabletop wet saw to tile our first house’s bathroom, our second house’s patio, and the sunroom floor in this house, I finally dropped $277 on this one at Home Depot thanks to a $20 off coupon (that’s not an affiliate link). The difference was incredible. I love this thing so much, I want to take it out to dinner. I’ve yet to decide my favorite part. Could it be the stand that allows you to work at regular height instead of crouching on the floor? The big water tray that means you don’t have to stop to replace/de-sludge the water all the time? 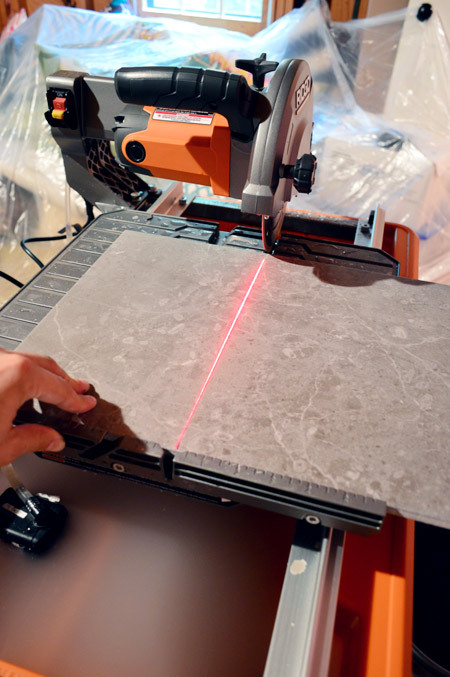 The laser to help keep cuts nice and straight? All contenders. But probably my favorite feature is the rolling tray that I can just set my tile on and slide through the blade. It’s not only a lot faster, it also helped me keep all of my cuts super straight. Anyways, let’s get back to the tiling process before I sound like someone trying to sell you a Super Shammy (“this will solve all of your problems and change your life!”). After getting some of the first few cuts done for our dry fit, Sherry and I went through all of our tile boxes to take inventory on the ones we liked best. 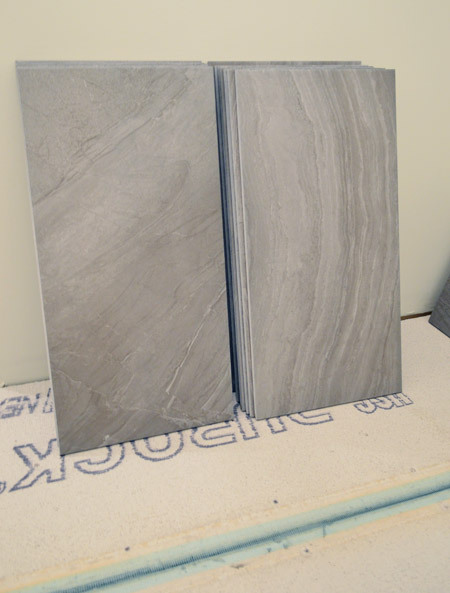 We love the movement and veining in the tiles, so we wanted to be sure the best ones ended up in highly visible spots in the room (no sense hiding our favorites under the washer & dryer). So we sorted through them and pulled out favorites (which we’d be sure to position in the middle of the room), regulars (not amazing, but not bad either – ones we could use near the door or along the wall), and a third pile we affectionately dubbed “the not-as-nicers” (not pictured). They were more spotty than veiny, so we reserved most of them for the where the appliances would go. 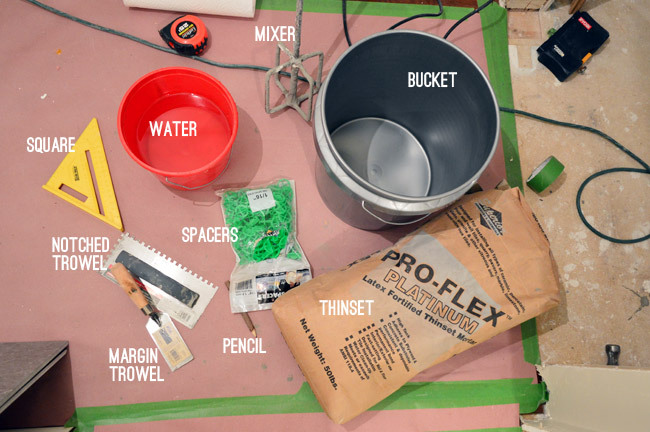 Here’s the gist of my supplies for actually laying the tile (wet saw excluded, obviously). I have a tendency to mix my thinset too thick, so I made a conscious effort to use a bit more water this time. They often say it should be like pancake batter and I like my pancakes thick, so I should’ve realized this about myself a while ago. I worked about two rows at a time, doing my cuts as I went. It helps to have a nice long level on hand to check that none of your tiles are sticking up oddly for a smooth, level result. These sorts of cuts were very straightforward. 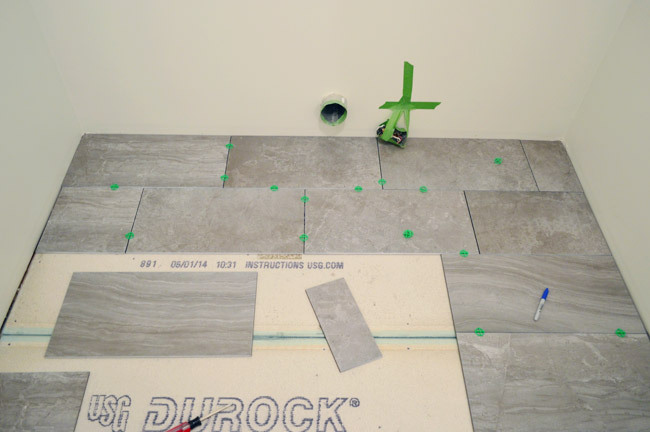 I started at the end with the full tile (or the 12″ half-cut tile) so once I got to the other side I just held up a full tile and marked where it needed to be sliced. Who knows how I ended up with this weird wooden tree pencil. It took me less than two hours to get the whole thing down once I started actually placing tile, so it was definitely one of my faster tile jobs. I left everything dry about a day and a half before pulling out my spacers (I opted to keep my painters tape contraption around the dryer plug through grouting). One of the parts I’m most proud of in this project is the transition, which Sherry and I decided we should attempt to make, well, transition-less. I had originally planned that we’d have some sort of transition piece (you know that slopes up a little to connect two different flooring types), but we’ve always liked the two transition-free tile-to-wood doorways downstairs (it’s perfectly flush where the tiled foyer meets the wood-floored office and dining room) so we opted to give it a go here too. 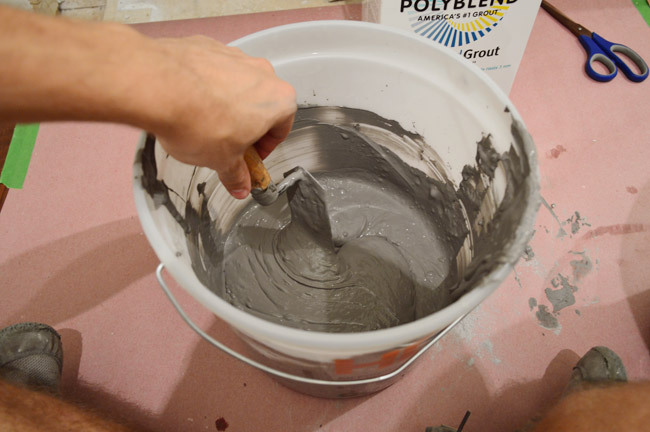 You add the water to the bucket first, then the grout powder. I started with a crazy amount of water for some reason, so I ended up mixing up a ridiculously large batch of grout for such a small room with so few joints. 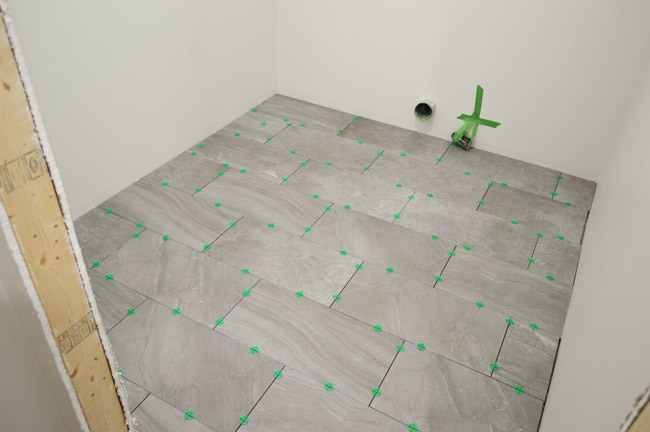 Grouting is pretty easy, especially when you’re working with big tiles, since it’s quick to cover all of the joints. 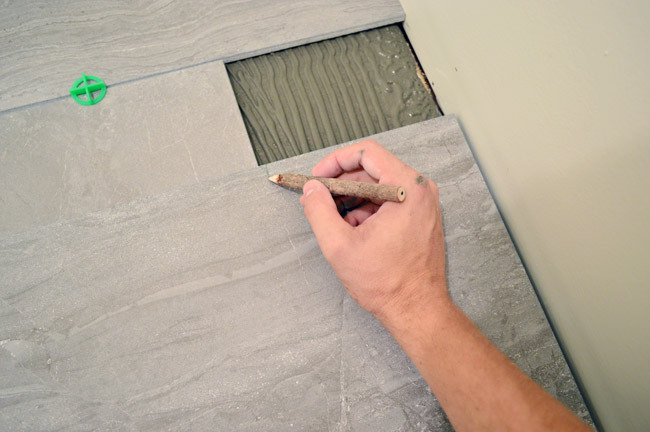 Using the rubber float you press grout between the tiles, then at an angle you wipe off the excess. 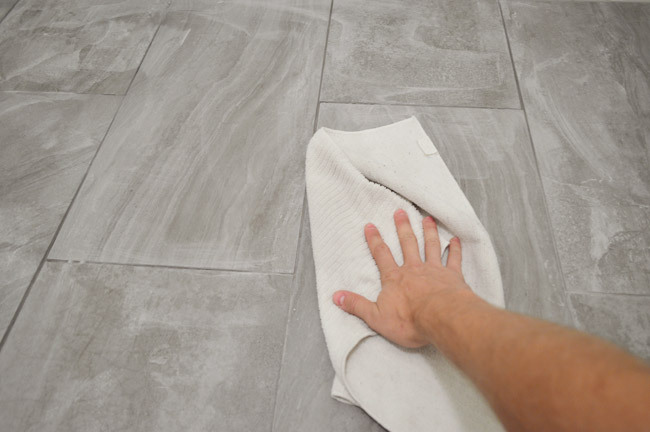 I was able to grout the whole room in about 20 minutes, and you can see how it starts to dry lighter – indicating that it’s time to start wiping it off. I made the mistake of using too much water when grouting the sunroom (which we think caused the grout to dry lighter than we had intended) so I was really careful to make my sponge only slighty damp when wiping off the excess this time. After a couple of passes with my barely-wet sponge, it still looked extremely hazy (this is the point where I think I panicked in the sunroom and got water crazy). But this time around I let it dry another 90-minutes and then came back with a completely dry microfiber cloth (they recommend cheese-cloth, but I didn’t have any handy). The microfiber cloth seemed to do the trick just as well, and some light scrubbing buffed off a lot more of the haze. Here’s the floor post-buffing. MUCH better. Phew. We let the grout dry for 3 day, per the instructions. 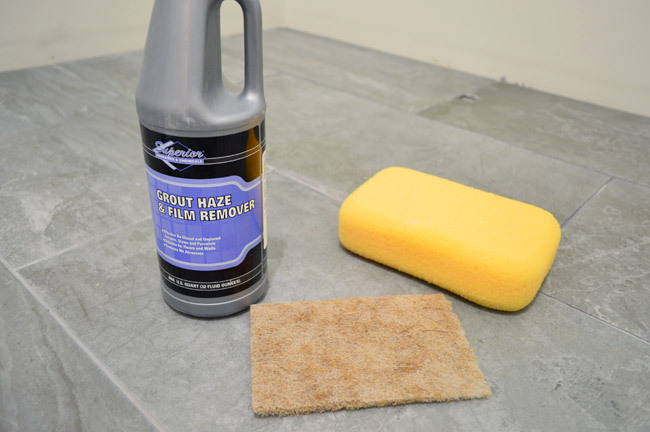 Things were still looking a little hazy in there, so Sherry busted out some grout hazer remove that we had leftover from the sunroom project. You basically spread it on liberally with a sponge, let it sit for a few minutes, then wipe it off with a scrub pad. Then she wiped the room down with clean water a couple of times to get all of the haze remover off. Then we waited for that to dry out for around 12 hours before applying a sealer on both the tile and the grout to help protect it from staining. It too is pretty easy to do – just wipe it on with a sponge, let it soak in for a few moments, and then wipe any excess off with paper towels. 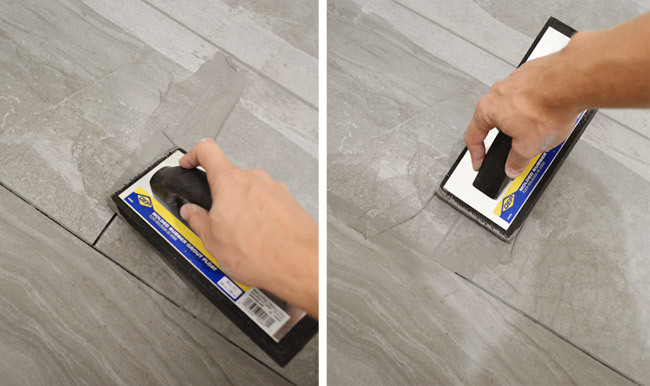 Those two steps definitely brought the tile to life a bit more, which is why we recommend not skipping over the haze remover step. Sometimes you don’t realize the film leftover from the grouting process until it’s gone. So it was pretty much $350 in tile and $100 in supplies. 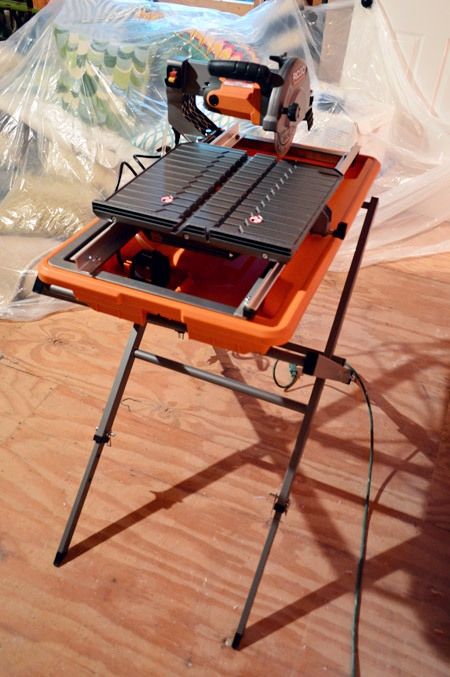 I’m excluding our new wet saw since it’s not a cost specific to this one project, and I don’t want someone to think that $277 must be incurred on a project like this, but after seeing what a difference it made, if you’re working with a cheap old tile saw I highly recommend the upgrade. I’m actually mad that I did our giant sunroom without my new tiling toy. Wrapping up this tile job means we can actually start putting this room together. Which is especially exciting because we bought our cabinets at Ikea on Friday (ignore the random pillows in that basket, they were for a cousin we met up with on the same trip). We’re thinking we’ll get at least the upper cabinets hung before we bring the washer & dryer in, since dropping cabinets on expensive appliances is not a risk we want to take. But once those are in, we may finally be back in business to wash our clothes at home again. High five! Anyone? High five? Are you leaving me hanging because I smell like a guy that just tiled without a washing machine? Jazz hands. Happy Feet. Shakin’ booty. I’d have it all over that tile! LOOOOOOOVE it! I want that for our bathroom! Hmm…..
You guys!!! That floor looks fantastic! How awesome to be so close to washing your clothes in that beauty of a room. High five!! Wow!! The floor looks beautiful! Great job guys! This floor looks great. Love how you guys have tons of room in your vehicle now. Perfect for your family. Cannot wait to see the laundry room transition. I love the striped basket in the last photo. Is that also one of your IKEA finds? I could not find it on their website. That’s a HomeGoods find about a month ago (it’s awesome for carting things back and forth in the car so we tend to use it for that). Super beautiful! I’m mentally planning our laundry room remodel (well, construction? Finishing an unfinished part of the basement? ), but our crazy ceiling has me stumped. But it probably isn’t too soon to start tile shopping, right?! Haha, it’s never too soon! Looks great! I love that you took the time to pick out the best tiles and place them where they’d get the most visibility. 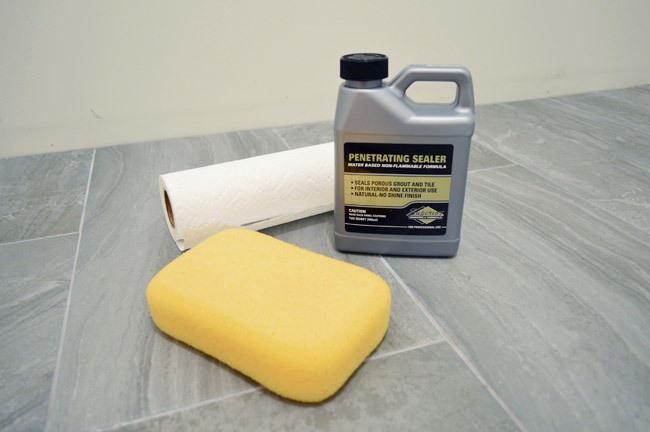 Question for you, though – is there a reason you use sealer after grouting, instead of buying the stuff that mixes right in with grout? 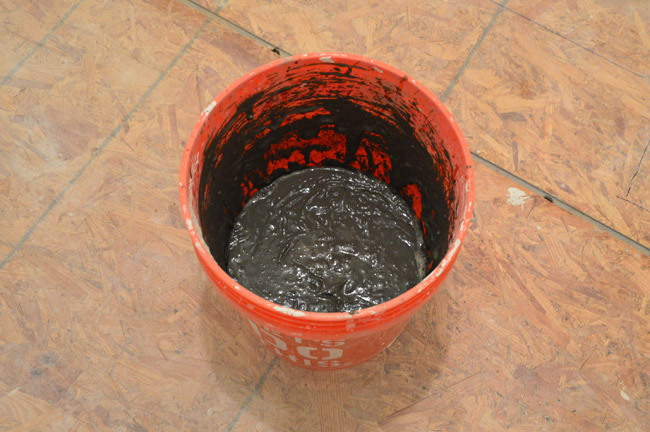 Even when we use admixture with the grout we like using the sealer afterwards. It just tends to protect everything at the same time (both the tiles and the grout) once it has been set/placed. That looks fantastic! 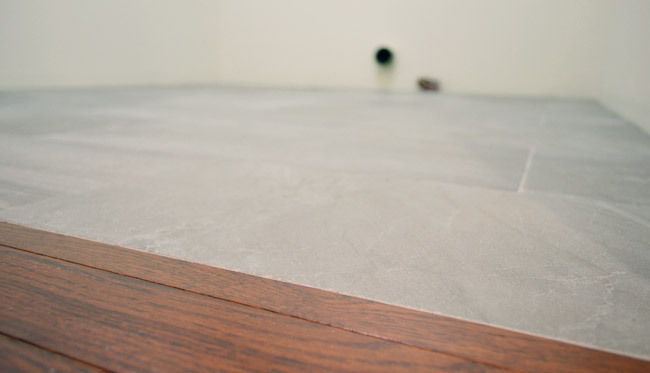 What is your plan for baseboards? Tiles? We’re bringing wood ones back in (like the rest of the house). Soon I hope! Along with a door! On this topic- though probably a dumb question – will you do the baseboards with the cabinets before bringing the appliances back in? The left wall looks so flush I wouldn’t even think you’d need it. 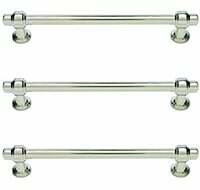 Another dumb question – do you do crown moulding in laundry rooms or is that not worth the time expense? Thanks Jackie! We will most likely add that back wall of baseboard before pushing the washer & dryer in (we like the idea of baseboard for the contrast/architecture it’ll add), and as for the crown, we think we’ll add it just to integrate the upper cabinets in a really clean way (it’s such a small room so it shouldn’t be too much money). Looks fantastic. My hubby has preaching the “right tools for the job” mantra for years. The right tools always come around to help in future projects so keep growing your collection. Love that tile! It’s a lot like what I put in our hall bath last year, and I still like it just as much as when we first put it in. The guy who did that floor said it’s not really the “professional” way to not use a transition strip between different floors, but I agree with y’all that it looks better. We don’t have strips between our kitchen and DR and it’s worked out fine. I’m really looking forward to seeing the final reveal! It’s coming together! 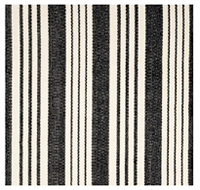 Great pick on the floor – it looks great with your existing wood floors in the hall! okay, first off, peppermint patties totally = jazz hands! third, that tile and that wall color is fab.u.lous! can’t wait to see the finished room. Oh man, sad about the Squirrels! Sounds like it was an awesome game though! We love going to their games in Richmond (Clara is a huge fan). Would love a post on what criteria you use on deciding whether to buy or rent tools/machinery! It usually breaks down to how often we’ll use something. If it’s a hole digger to build a deck that we’ll never use again, we’d rent it (same with soemthing like a drywall holder, since most of our house is already drywalled). But if we have three bathrooms and a kitchen to renovate (lots of tile!) 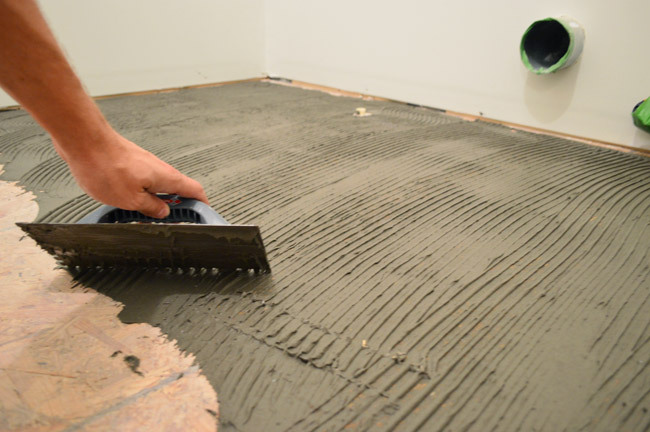 then buying a better tiling tool makes more sense than renting it. Looks great! I feel tired just looking at all of the work y’all have done in there. Looks awesome. reminds me of when I helped my dad tile his kitchen when I was younger. It was so much fun. Prob because I was little and just had to do the spacers and grout but still fun. Ha! Thanks for not leaving me hanging, Nicole. I can’t believe how fast this is going and with the cabinets bought, it makes me wonder if you are going to finish it within the week! Because it sure feels like it! Congrats on this incredible project! love, love, love that tile!!!! Wow, love it! Interesting that one is supposed to use both thinset and screws to hold down the cement board on the floors. I did not know that. 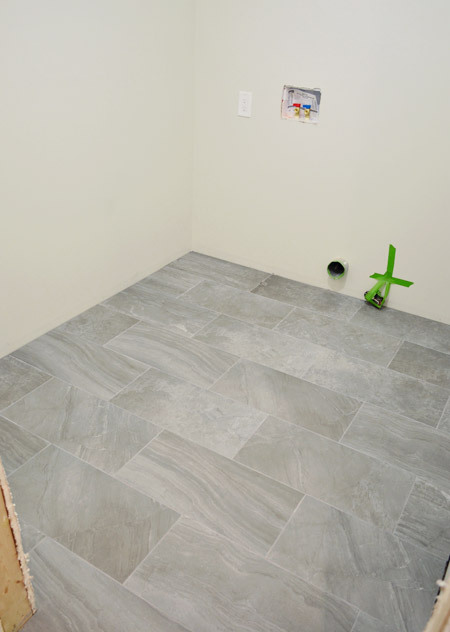 Then again, whoever tiled the powder room in my house just put the tile right on the subfloor. Needless to say, we have tiled popping off all over the place. It’s a rental, and my landlord is cheap, so I just live with it. Having recently spent a lot of time without a working washing machine (see above, cheap landlord), I would have moved those puppies back in as soon as the grout had dried! I was thinking the same thing! I bought the cement board and tile and special screws from home depot a month ago to prep for our mudroom redo and the home depot person helping me said nothing about putting thin set under the cement board. The one I got has special screw marks, about every 12 inches over the entire board, sides, middle, etc. Does that mean I don’t need to do it? The more I researched it the more the Thinset step seemed to be recommended (just to reinforce things) so it made us the most comfortable to go that route. I did see some tutorials without it though, so you might be ok skipping it. Maybe it would be worth asking the Home Depot person in that area what they recommend with that specific cement board? 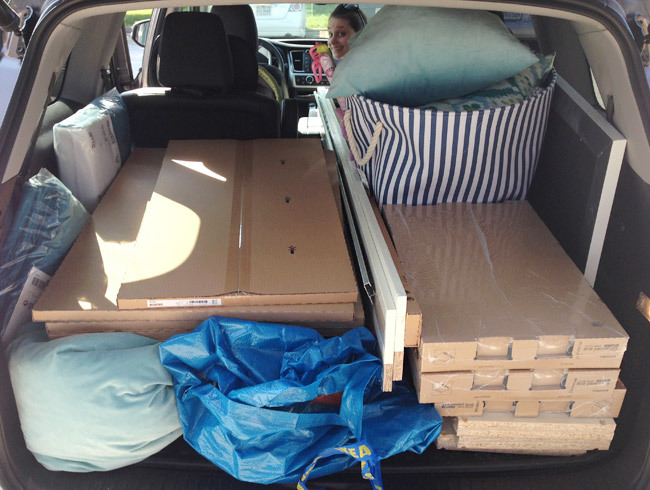 What’s your secret to getting to and from Ikea without the crazy traffic? I also live in Richmond and would love to go to Ikea more often. We were stuck in 6 hours of traffic (they completely closed 95 thanks to a truck that spilled acid on the road), so sadly we have no secrets. Only a burning desire for a Richmond Ikea. Thank goodness we were doing other things (like meeting up with family and taking care of some book stuff) on that trip too, so it wasn’t just for Ikea. I live in Northern Virginia about 20 minutes from the Ikea that is closest to you. Even I complain about the traffic to get there. Now knowing that you make the trip from Richmond I am sticking my foot in my mouth and counting my blessings. Holy bananas! Was that 6 hours of traffic with 2 kids in the car? Just reading that gave me anxiety! Yes, they were such good sports. There were a few feeding stops for Teddy boy! Our nearest ikea is a 4 hour plane trip to another country :( we have managed it once but baggage restrictions meant I couldn’t bring back half what I wanted to! Don’t hate me when I tell you that I live like 10 minutes away from Ikea! I was looking forward to seeing an update on the tile work all weekend! 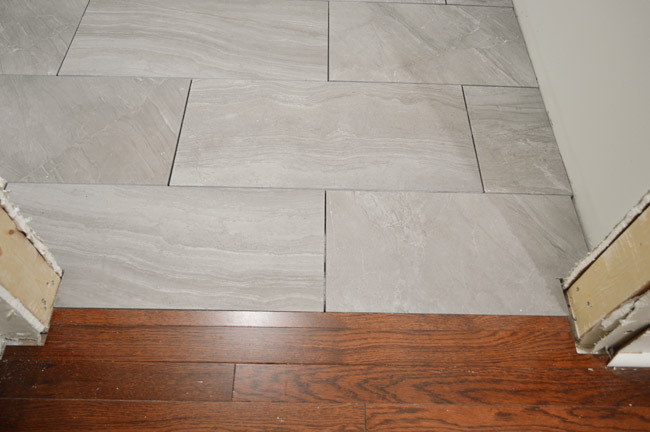 The tile looks beautiful and I love that you were able to do without a transition strip. 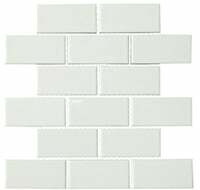 I can’t wait to see the installation of the awesome backsplash tile you guys selected! YOU GUYS! This looks amazing!!! I am so happy you decided to go full-steam ahead with this project. Going to make a HUGE difference. Oh man, you should see that room right now. With book project stuff everywhere it’s a CODE RED. Haha! It looks amazing!!! So much so that I went looking for the tile and had a tough time as it is ‘Blast’ anthracite not ‘black’ as listed in your breakdown. I hate to be a corrector, just trying to help searchers like me! Nice job. Is there a small hole cut in the back, to the left of the dryer vent? What is that for? That’s the washer overflow drain (so if things leak the water will be routed into the dryer pan and down that pipe so the laundry room doesn’t flood). I’m confused since I didn’t see any mention of an overflow drain nor do any of your pictures show one (there should be a hole in your cement board if you had a hole cut out for a drain in the floor). 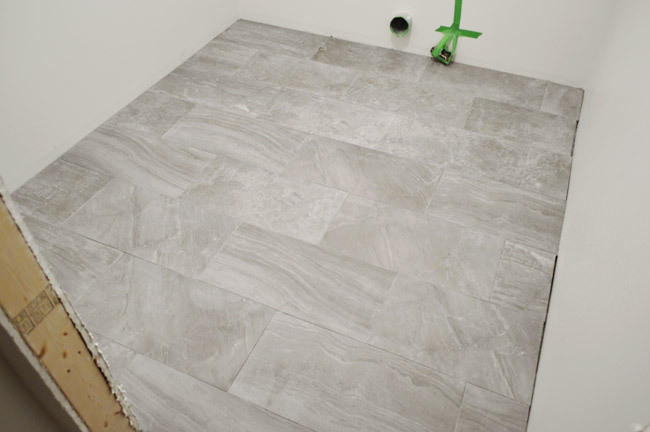 It looks like you chipped a piece of the tile then filled it in with grout when you grouted the floor – not that you have an overflow drain. If you guys did install an overflow drain, that would be incredibly helpful information for your readers if they attempt to tackle this project themselves. Did you have to wait for the thinset to dry before you could walk on it to add the tape and screws? 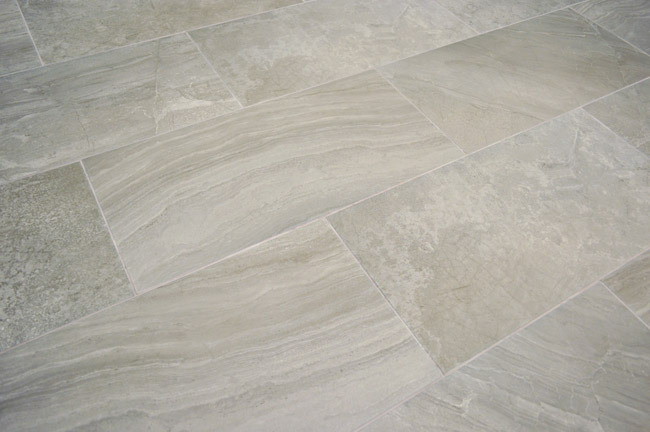 Also, did you grout joint where the tiles met the wall or where the tiles meet the hard wood floor in the hall? I gave that thinset a few hours to dry before adding the tape and screws later in the afternoon (although I did walk on them right after putting them down just to press them in). As for the joint where the tiles meet the wall, I didn’t grout it (to leave room for expansion of the wall – plus it will be covered by baseboard) but I did grout the space where the tiles meet the wood in the doorway so it looks nice and clean (that’s how it’s done downstairs). It looks so good!! 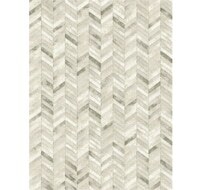 I LOVE that tile and I can’t wait to see it with the backsplash tile you guys picked out! Looks so nice! I am so impressed by your skills, especially that transition – awesome work! She’s so funny! She loves “the new secret room” – even though I told her it’s not a secret, she is convinced it’s for playing hide and seek. Might be sad to see a washer & dryer in there soon. Haha! Ha! Reminds me of my 5 year old. When we rolled out a new rug in the living room, she was so excited to have a dance studio! When we put furniture back in, she was quite sad. HIGH 5 JOHN! HIGH 5! I’ll even risk the exposure to your underarm stank for that well-deserved five-r. This whole adventure has got me itching (not from lack of clean clothes) to re-do our laundry room. Thanks for not leaving me high and dry Treana! I see what you did there John… dry… dryer. So clever. We did a similar tile in our hall bathroom and we love it so far. 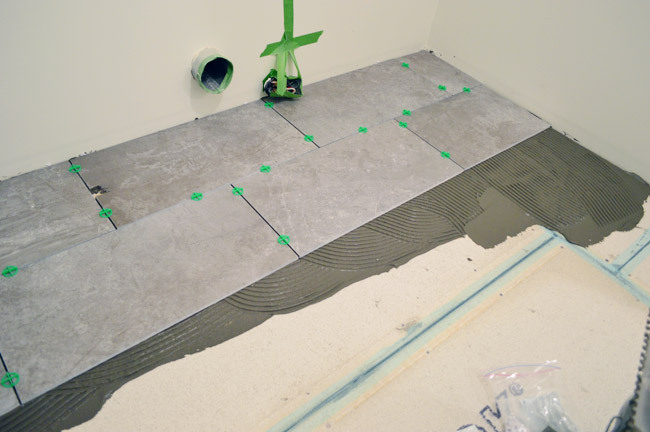 It was pretty easy to install with the large tiles and the grey is such good choice for longevity. The tile looks great. I’m so glad you put in an overflow drain. We have had upstairs laundry rooms in four houses, and it comes in handy, if you know what I mean. I still highly recommend a tube sky light. It will rock your world. You will hunt me down and give me a kiss for making the suggestion. I promise. We have three in this house in baths with no windows, and they are such a treat. Another vote for the solar tube skylight! They are the bee’s knees. I had one in my bathroom growing up. We didn’t even need to use a light during the day. We have a 2′ x 2′ skylight in our bathroom, but I wish we just had one of those Solatubes instead. Numerous times I’ve looked up to see a crow or flicker peering down interestedly at me while I do my business. Disconcerting. So when y’all were putting the tape and screws into the cement board, were you able to stand on it while the thinset was still wet or just reach across the board? Thanks Emily! I gave that thinset a few hours to dry before adding the tape and screws later in the afternoon (although I did walk on them right after putting them down just to press them in). Looks great!! 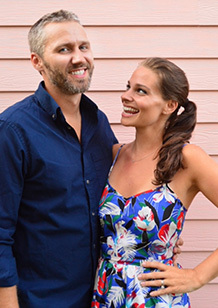 I have to say, we just bought our first house last weekend and I’ve been poring over old posts looking for tips and tricks! Thanks for being such a great resource! That tile really does look gorgeous! It almost seems a shame to cover it with anything. I’m impressed– it looks perfect. The even transition is awesome! 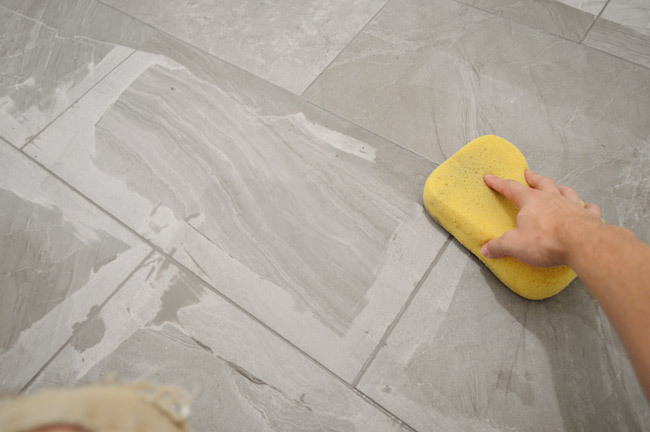 Question – why did you choose non-sanded grout? I thought if space between tiles more than 1/8 inch one should use sanded grout. 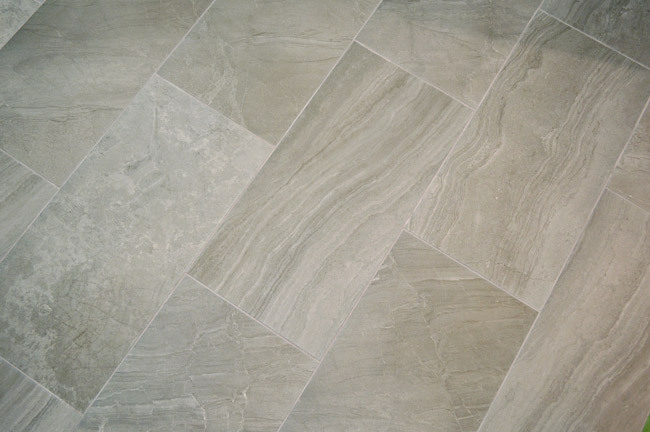 I only ask as son and wife have just redone kitchen and tile men did not do a good job of grouting – too little grout and voids and TOO dark. It needs to be redone and I told them sanded grout is what they needed. Oh yes, always use sanded if the space is more than 1/8″! Our spacing was 1/16th (half as much as a 1/8th gap) so we didn’t use sanded grout in this case. Wow – love that tile! Can’t wait to see the finished room! Damn, that’s a fine transition! I’d be patting myself on the back too. Lookin’ good! Totally jazz hand worthy! And that is the absolute coolest saw ever. Have the walls already been painted? I thought I’d read last week where you guys picked the color but I guess it’s hard to tell with nothing else being in the room yet. Can’t wait for the next update! Yes, they’re painted but it’s so hard to tell without white trim/baseboards/door! High five on that awesome floor, high five on getting the washer/dryer back in, high-five on the project as a whole and one more high-five for the heck of it, with some jazz hands at the end for good measure! I just love the transitionless transitions! I did this recently when we had our kitchen and hall tiled. 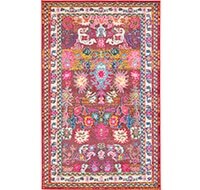 It is great for cleaning, rolling items from room to room, and easy on your barefeet. Just wanted to say I think sorting through the tile to have your favorites in good spots is an inspired idea. Makes so much difference, especially in a space where lots of it will be covered up. It’s all my fault. I take the blame! 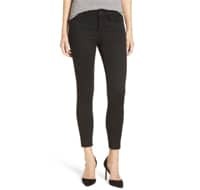 Honestly, I’m one of those guys who sometimes believes you’re paying extra for a brand name and there’s not much difference, but in this case the difference was incredible and completely worth it. Thanks to it being unsanded it didn’t scratch the wood at all. We actually pulled the rosin paper back while grouting to make sure the tape/paper didn’t cover an area that needed to be grouted. Then we just wiped down the wood and it was all good. 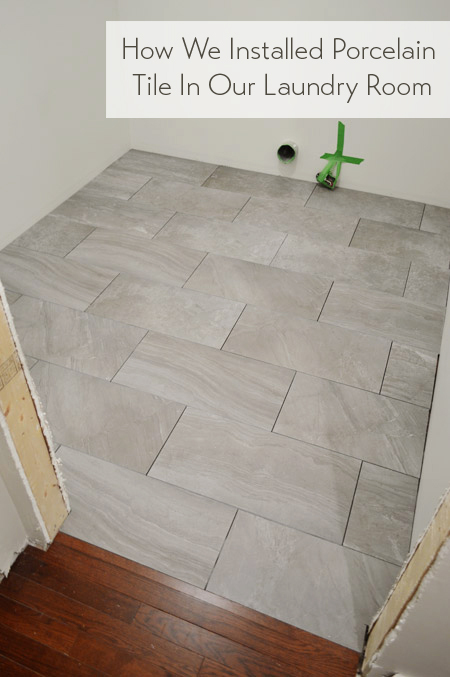 So you used grout between the tile and wood? I thought that grouting a transition was a big no-no and that it will end up cracking? 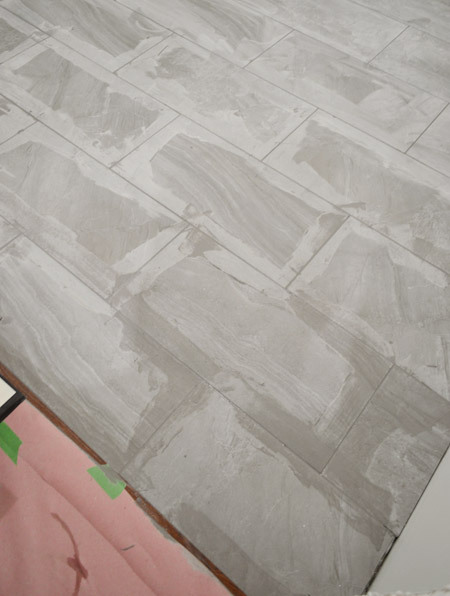 I’m not sure if you can tell from the photos (like this one or this one) but it was an extremely close seam, so we don’t think there are large enough pieces of grout to crack or flake, but it’s such a hairline space that we could just leave it bare if anything comes out. The wood-to-tile seams downstairs seem to be doing ok 30 years after they were put in, so we have hope it’ll work out. We’ll keep you posted of course! Woohoo!!! That is so exciting! I am amazed at how beautiful that tile is. Greetings from Wyoming, where I actually am staying at the same place as Joan Rivers! She’s super sweet! I like the tile, looks great! 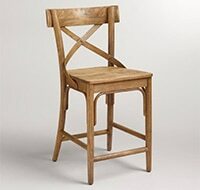 Have you two ever consider supporting a local craftsman and having cabinets built instead of popping over to Ikea for everything? We definitely would consider that! This is actually our first time trying Ikea cabinets (we used Kraftmaid ones for our first kitchen through Home Depot, and secondhand ones from the Habitat ReStore for our second house’s kitchen and the office built-ins we added there). Do any locals have any cabinet maker recommendations for us?